Chuck was great in the Philip Glass documentary “Glass-A Documentary in 12 Parts”. It was a revealing portrait of their friendship. I love his work. Richard, I will have to track that down. Somehow I missed it. I’ve been a fan of Close’s since my days in art school. An unspecified “few” years ago! I love his evolution as an artist and that he was an art teacher for many years. Like myself. Just the other day I read a story of how his mother took him at the age of 11 to the Seattle Art Museum where he discovered and was repulsed by the drip paintings of Pollock – only to driven to try doing some of the same a week later. Its most affirming when you find out those you admire and who inspire happen to be just people too. I truly appreciate you sharing this and following my ruminations here. He is such a huge inspiration for me. 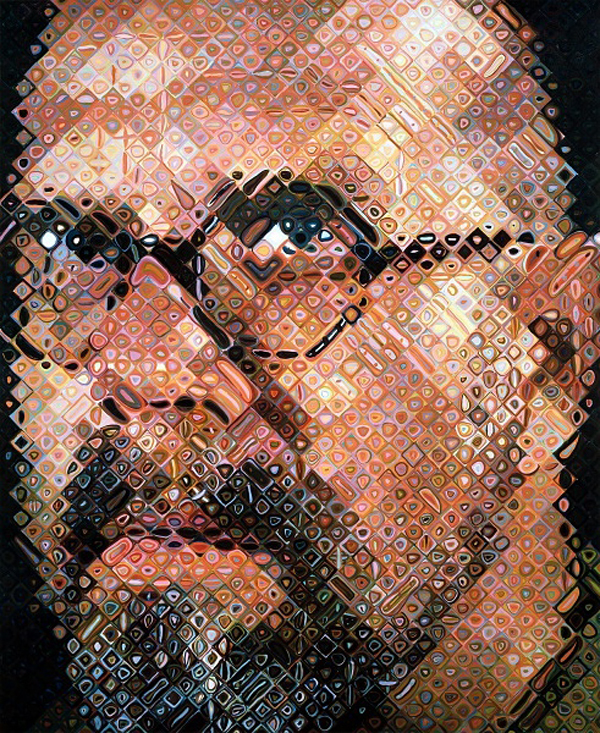 For those who don’t know, Chuck Close started by painting photo realistic portraits, then had a seizure that left him paralyzed. HE STILL PAINTED! His art actually improved, they are still readable from a distance as detailed photographic portraits and up close they work as abstracts as yummy as a box of chocolates. The work is more complex, mysterious, fun and colorful! Absolutely smack on James my friend. Thank you for sharing this. A few years back I purchased a HUGE volume on him and it is endlessly fascinating! Thanks for following my work and writing here! Richard thanks for reblogging this, cheers! Indeed Richard! I suppose an aritst will struggle a long time, in many cases, to figure this one out! Close has done the uninitiated a favor has he not? 🙂 Have a great weekend Richard! Indeed, I worked for many years as a Scenic Artist and then as a Production Artist. You clock in and you go to work and the boss doesn’t care about inspiration. The Art is in the DOING! I so relate Richard. I ended up taking a 25 year sabbatical before I could do my art my way. I just could not do the commercial route. It didn’t seem honest to me. And so I’ve waited so long to finally do my art my way! And its been worth it because now I have a lifetime of experiences to share and it flows out of me as an honest expression of who I am! Take care Richard and keep up your excellent work! Hi Gwennie! Thanks for visiting!